In this how-to post we’re going to show you how easy it is to ‘open’ your data. You’ve probably heard mention of open data in the press. To generalise, they’re probably talking about organisations publishing (usually on their website) data about the work that they do, for anyone to access and use. When people with the right skills get hold of data about services they can create interesting tools, maps and visualisations by combining it with other publicly available information. There is a growing movement towards requiring publicly funded organisations to publish information about the work that they do. This is already happening in the USA and it’s on its way to the UK voluntary sector. It’s already happening in the UK scientific and academic sectors. To be clear from the outset, this data is not the names of the people you work with, it’s not their date of birth or email address, it’s not even the postcode of where they live. Opened data cannot be something that would allow others to identify a person. Most of the data that you can open is just numbers. How many people you worked with last year, how many people access each of your different services, how many support groups you ran in the last year are just a few examples. 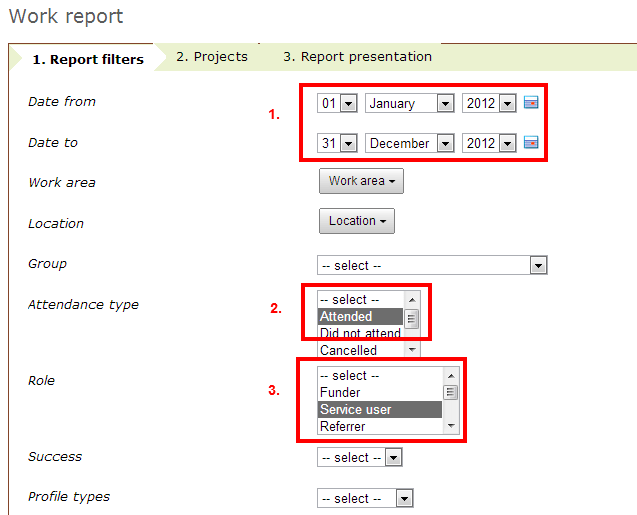 For this example we’re going to extract and open data about the number of people you worked with in 2012. Date range 1st Jan to 31st Dec 2012. Attendance type ‘Attended’, so we don’t include anyone who cancelled or didn’t show up to events. Role ‘Service user’, so that we’re not including any staff or volunteers. The table you get will show you the number of attendances at your work, the number of different people and the number of sessions you ran in that time. Our next step is to download this data. Click on the download link and it will save to your computer. To open your data it needs to be in a place that others can find it. If you do choose to do that then tell Slash Open so they can add you to their directory. Well done, you’ve just opened up your data. Now that you know how many people you worked with last year, take part in the Open Data Challenge. If you’d like any help with opening up your Lamplight data then just drop us a line. Tell some people! #opendata and #vscopen are twitter hash-tags used a bit, and let @slashopen know too (and tell us @LamplightDb). There are other posts about open data that you can read and some things we’ve written elsewhere and other links on our /open page. Previous Post: What do we need to make open data standards work?